3rd i QC is pleased to announce the establishment of Ultra HD Blu-ray Disc verification rooms at their facility in Culver City, California. These new rooms have been tailored to the advanced video and audio capabilities of the new Ultra HD Blu-ray Disc format. 3rd i QC’s new Ultra HD Blu-ray Disc evaluation rooms feature state-of-the-art equipment, including primary displays capable of Ultra HD resolution, HDR, and ECG, various Ultra HD Blu-ray Disc players, and audio receivers and speakers set up for full three-dimensional advanced audio format decoding. As with all their evaluation rooms, their new Ultra HD Blu-ray Disc rooms feature 3rd i QC’s proprietary audio metering technology for better accuracy. Ultra HD Blu-ray Discs offer consumers a true cinematic experience at home. 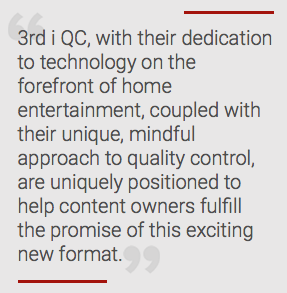 3rd i QC, with their dedication to technology on the forefront of home entertainment, coupled with their unique, mindful approach to quality control, are uniquely positioned to help content owners fulfill the promise of this exciting new format.